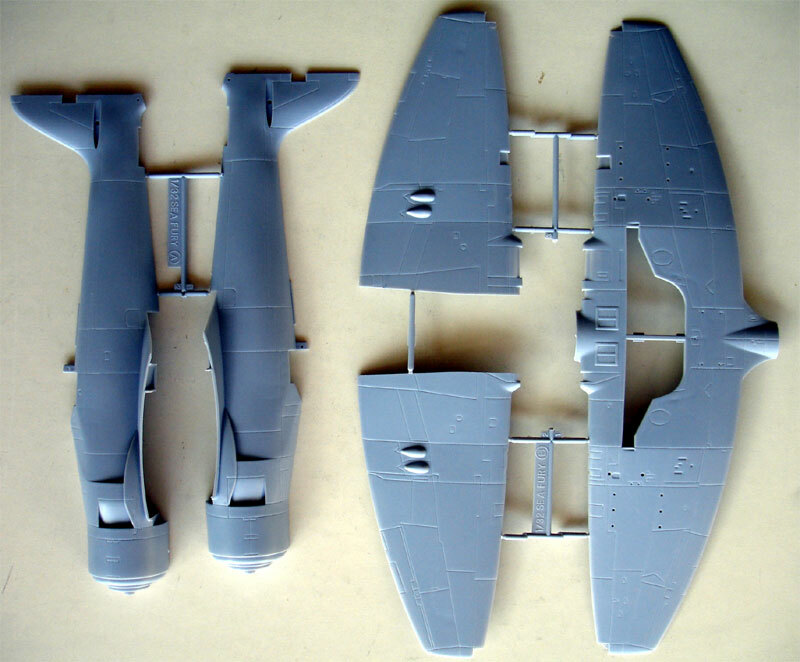 The Sea Fury has not been available in this scale through an injection moulded kit before. In the past vacuforms (such as ID models) could be obtained and the excellent resin Fisher Model and Pattern kit was available but at quite some cost. 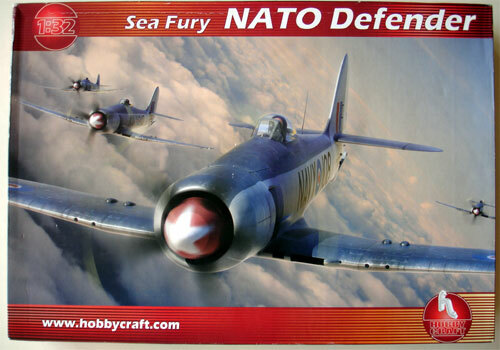 Mid 2008 Hobbycraft of Canada came with a Sea Fury FB.11 kit which was more than welcome for large scale builders. 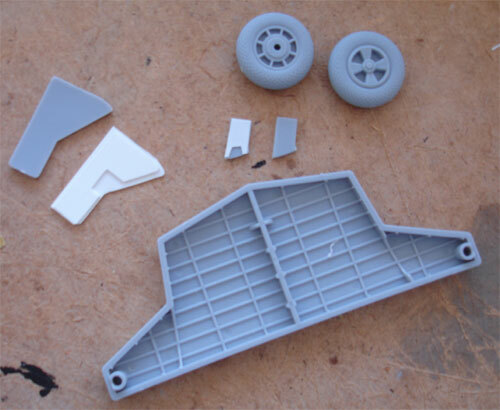 The kit has about 80 grey injection moulded parts and a single piece canopy. The basic dimensions look accurate and overall this kit is OK. Hobbycraft kept the costs of the kit low by making a lot of areas in this kit simple. 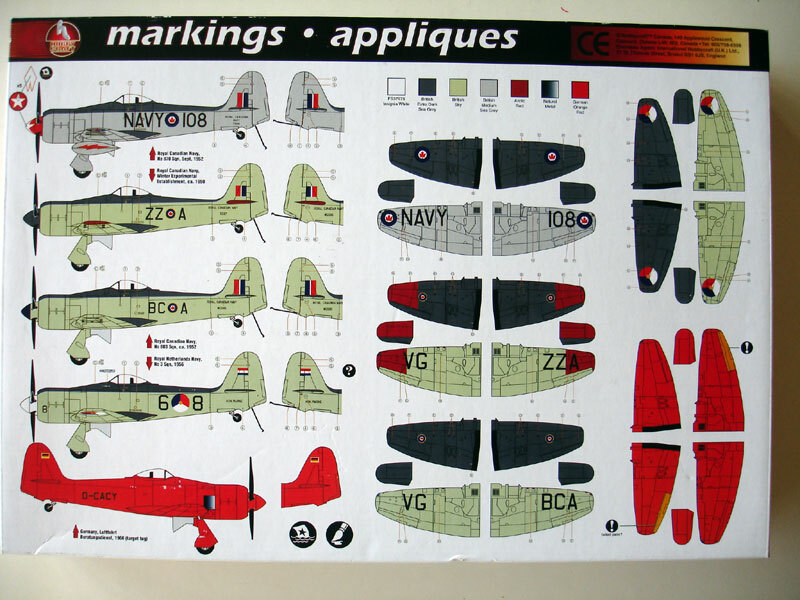 The kit does not have for example the option to fold the wings; this would require outher wing separation and detailing (a Fisher set is available if you want). The stores comprise the fueltanks, rockets and bombs and these are all usable. 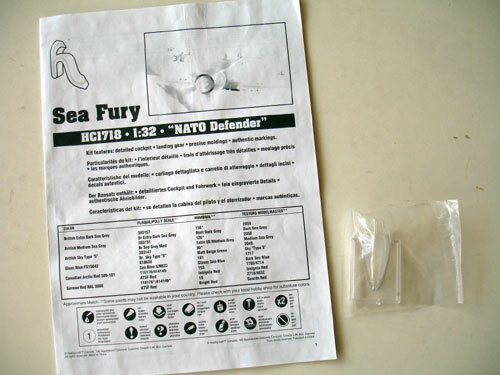 I got the NATO DEFENDER kit. 2. 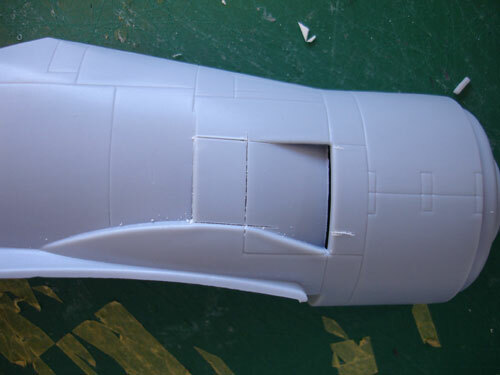 The cockpit tub opening is way too small; remove the area aft of the strange seat "head rest" and add with some card a better representation of this area. 3. The cockpit interior is very sparse to keep kit costs low with only floor tub, seat, control stick and very basic instrument panel. Doing some detailling yourself is a good option as typically for those days the interior is mostly black so not a lot of detail will be seen. 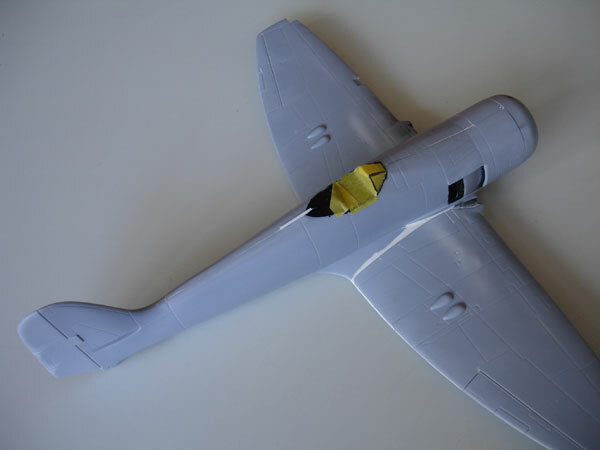 But as noted, the Fisher Model and Pattern cockpit set with resin parts and very nice seat was the solution (also includes much improved canopy). 4. The oil cooler intake located on the port wing is a too shallow. 5. 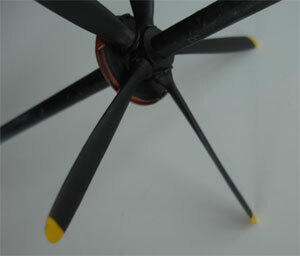 The propeller which is assembled with a hub and separate blades and spinner is very inaccurate. 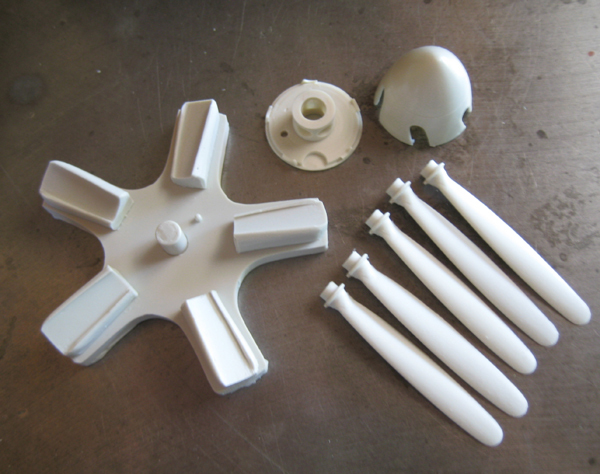 The spinner is also way too small and gives the overall kit a somewhat inaccurate feel. 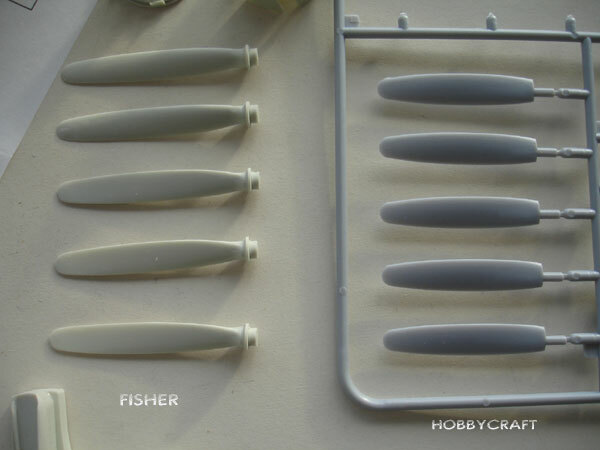 I bought the Fisher Model and Pattern propeller set #AHC3 to replace the kit parts. 6. The wing upper profile curve is a bit too flat and in addition the main wheel bay is too shallow. 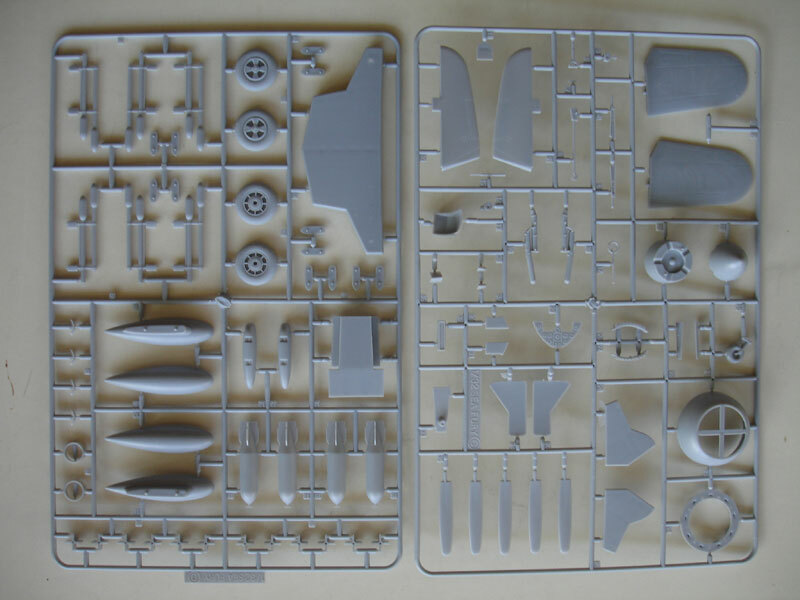 In addition, further detailling was done to the Hobbycraft kit in this scale such as adding some rivets details and filling some heavy panellines in areas. 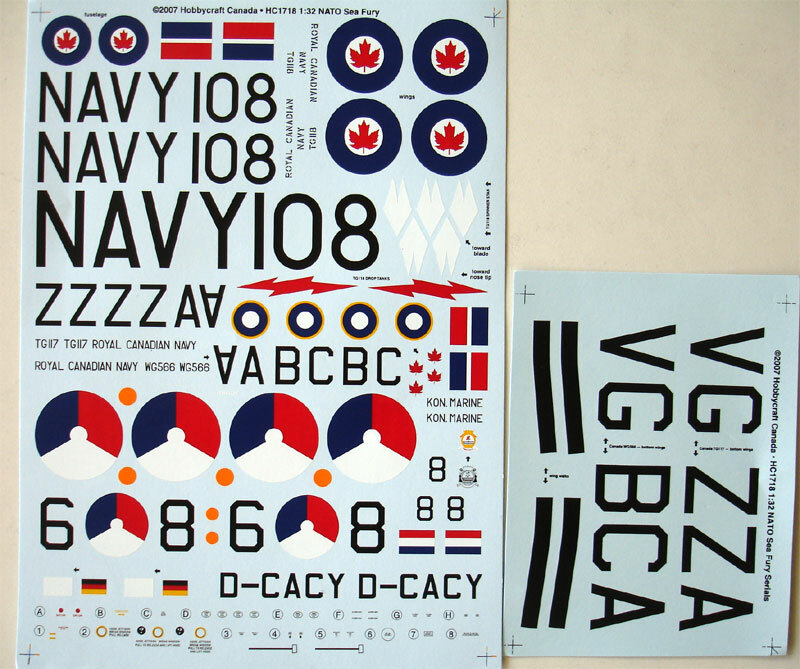 For this kit a nice Dutch MLD scheme was picked and I opted to make the MLD Sea Fury with code "6-26" of the Royal naval air service "Marineluchtvaartdienst" MLD 860 squadron with orange propeller spinner. It is a nice scheme and I had a couple of pictures. 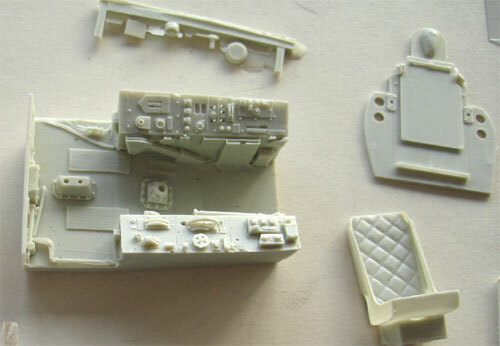 - Obviously, work was started with assembling the purchased Fisher cockpit set. 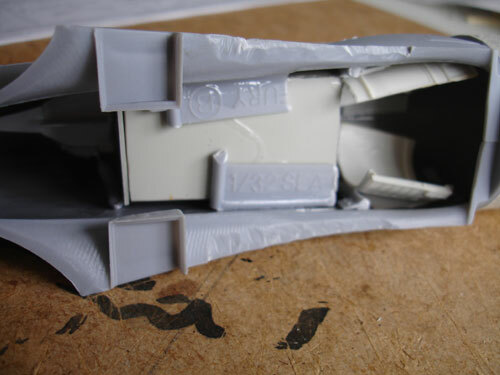 It also has sidewalls and this required removing the rib detail on the cockpit insides of the kit. The Fisher cockpit set is very nice with lots of detail. 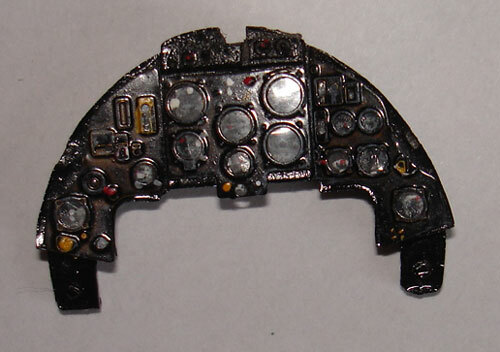 The instrument panel got dials and some paint on red and green was added. Later on it was seen that the instruments are very well hidden by the hood and you really need to look well to see them. 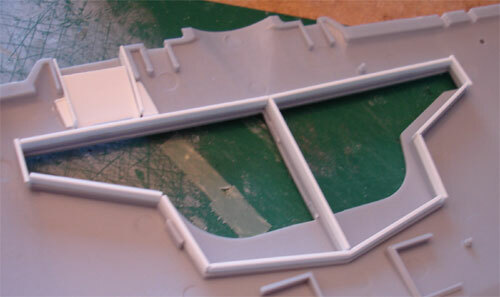 The Fisher canopy is very good but you need to separate the two bits with a razor saw from their mould block. - The lower oil cooler on the port wing is too shallow. This was solved by cutting it out from part #B1 and making it more prominent with some card and putty. - The main wheel bay was made more deeper. 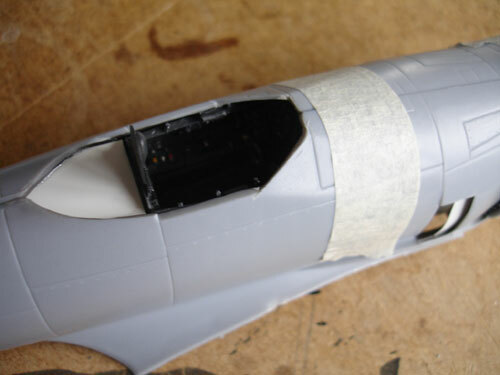 I added thick strip of card of 3 mm high to have a deeper bay and bended the upper wing halves to a more profiled shape. 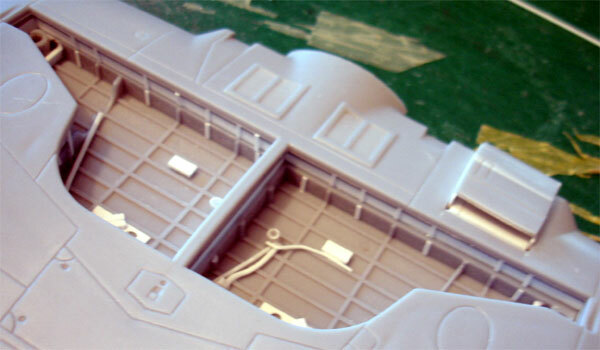 The bay and also the inner surfaces of the gear doors were detailed with styrene strips of Evergreen. The details are not that many but some is there. 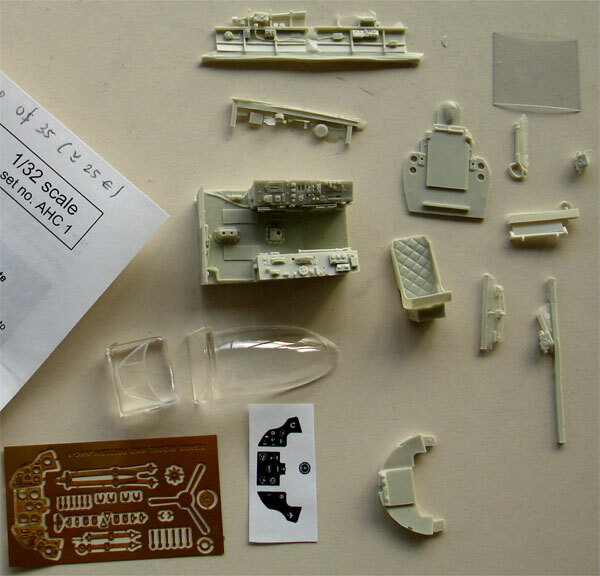 (you can buy another Fisher set, but with some rod and strip you can easily detail the bay yourself). The wing upper profile is now also much better. NOTE: I forgot to glue part #E29 assuming there was a leading edge light. There is none, so fit and fill. - The wing aileron edges were sawed in to give a better look to these. 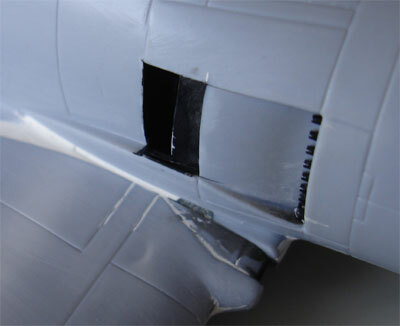 - In the fuselage halves it was decided to open the panels aft of the exhaust pipes. These are movable panels that enable extra cooling of the interior if required. 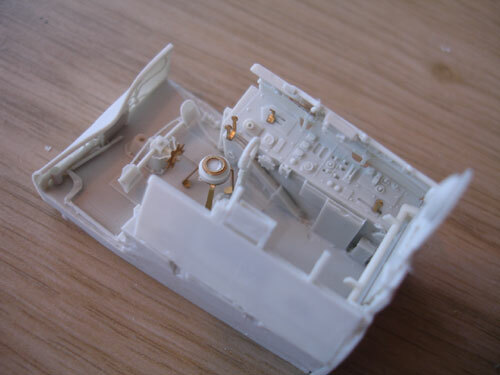 Internally some details were added from scratch plastic bits. 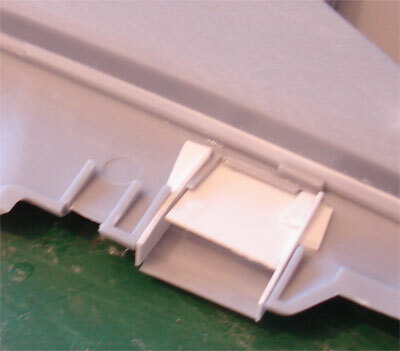 - The aft tail wheel well was boxed in with card. 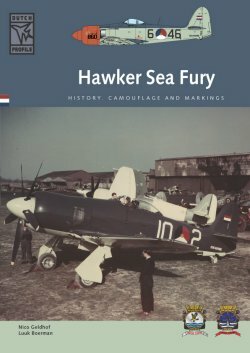 - The two fuselage halves were mated together and the assembled Fisher cockpit put inside. Some strips were added to get more strength here. The fit of the improved wing with its deeper bay and curved profile was OK but it will need filler in the upper wing root area. 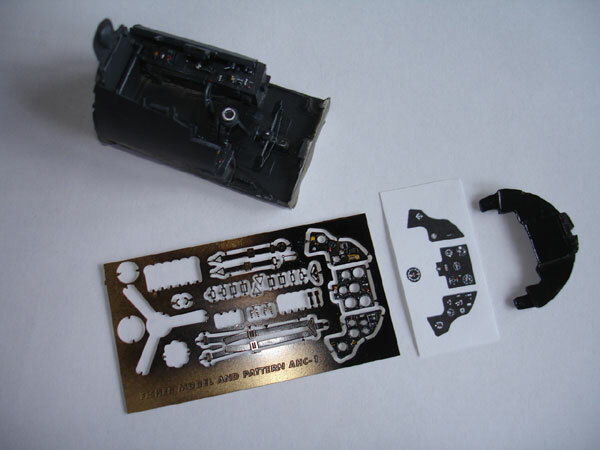 - The kit engines' face bulkhead does not need any extra work as almost nothing can be seen and the propeller covers a lot of this area. 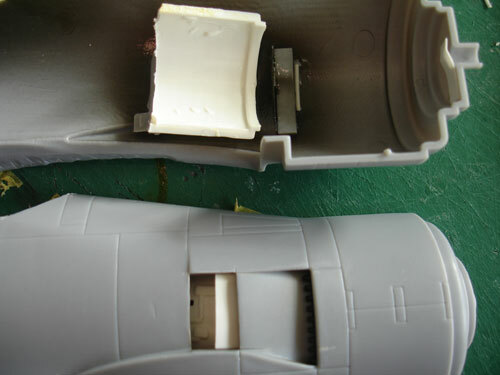 The fit of the engine cowling is excellent. 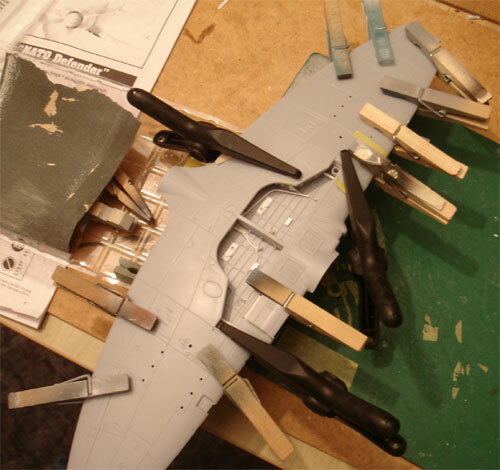 - The kit propeller parts were not used, the prop was the much better one of Fisher. 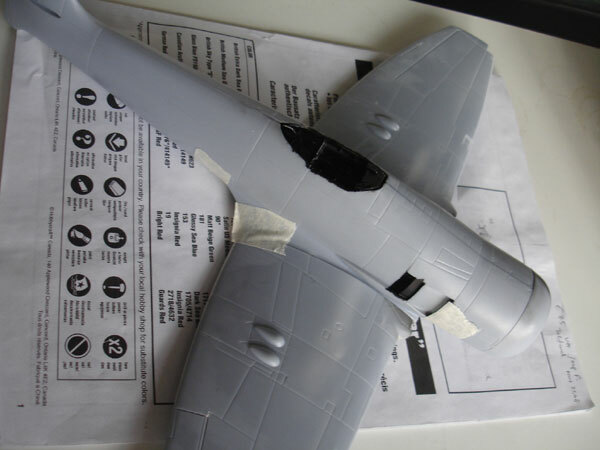 - The tailplanes were not yet assembled, this will be done after applying the paint scheme as they fit well and need no filler. 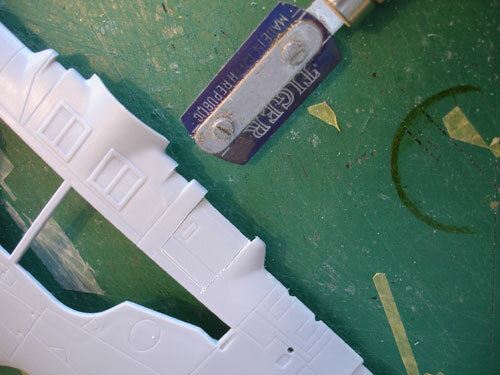 - The landing gear was left for alter after painting and decalling. 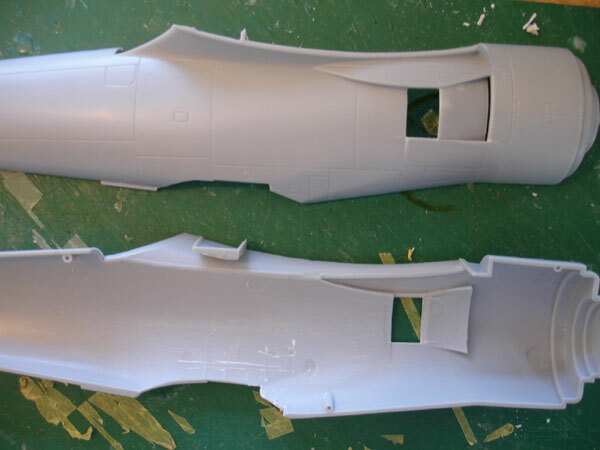 Now it was time to do some gap filling, particularly at the amended wing root area. 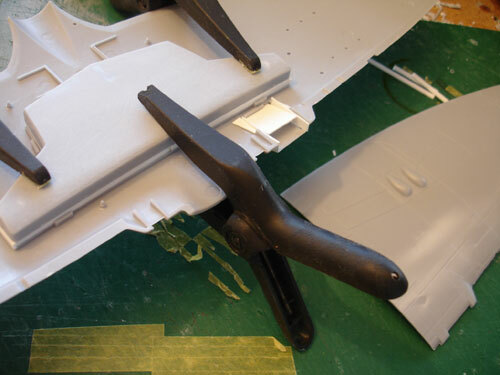 A little filler is needed at the wing-fuselage join at the front and at the wing roots. 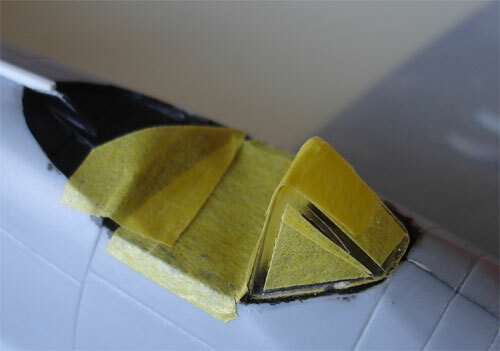 The Fisher windscreen was masked with tape for protection, set onto the model and some minor filling was needed. 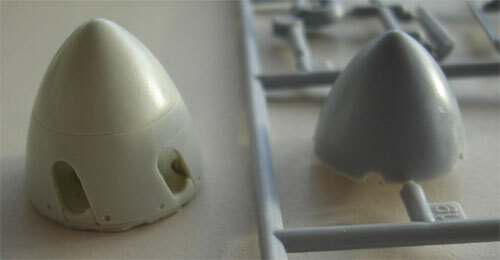 After sanding and polishing, a coat of light grey primer was sprayed on the model. When this seemed OK, some black pre-shading will be done at various panels. This will give a better look later on when the final coats are applied.